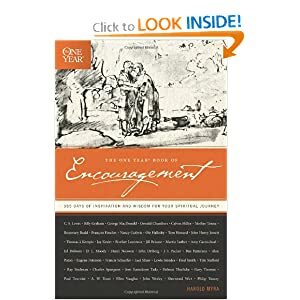 From the publishers of The One Year Bible and so many other great publications comes The One Year Book of Encouragement: 365 Days of Inspiration and Wisdom for Your Spiritual Journey. This devotional was compiled by Harold Myra. Who doesn’t need a little encouragement now and then? Actually who doesn’t need it daily. This book is a day by day tome of wisdom and encouragement. It combines daily messages from some of the today’s and yesterday’s most beloved and revered spiritual guides. You will read insights from Mother Theresa, Oswald Chambers, Brother Lawrence, John Wesley, Billy Graham, Francis Schaeffer and John Ortberg and that is only the tip of the iceberg. Each day begins with a half page encouragement from a fellow pilgrim. The thoughts are completed with a prayer and a scripture. I have really enjoyed reading through this devotional book. The only problem was that I rarely stopped my reading at just one day as there are so many great men and women of the faith that are included in this book. I suppose this is a great way to be introduced to some perhaps lesser known spiritual writers as well as be reminded of the words of those who are already familiar. I think this is a great book for personal use or as a gift. I would love to pass on the encouragement and give away this lightly used copy of this book. and you will be entered to win the copy. I will pick a winner on Wednesday…so don’t dilly dally! I was pleased to receive a complimentary copy of this book from Tyndale House Publishers, Inc. in exchange for my honest review. Thank you so much Tyndale! PS Thanks for taking the time to encourage us/me! Edges of His Ways by Amy Charmichael or anything George MacDonald…and a Stumptown Americano with whip cream! Pumpkin spice coffee is my autumn therapy. Well sarah and i enjoy a hot spiced carmal apple cider after a long day of grocery shopping. Hhmmm…I usually go for a mocha, but around Thanksgiving and Christmas a pumpkin spice latte is pretty nice too.